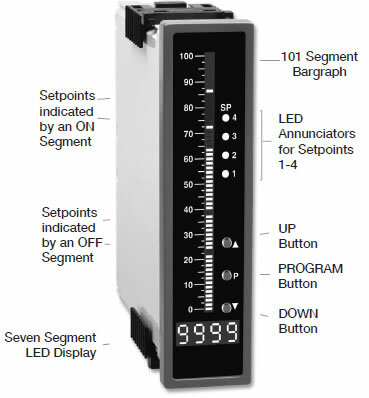 OMI 220 bargraph indicator, 101 segment, 4 digit 0.32" LEDs in a 9/64 DIN case. Featuring new version 2.0 software with one-colour brightness control, this smart tricolour or mono-colour digital bargraph has four fully programmable set points for monitoring, measurement and control applications. External transmitters or signal conditioners can be eliminated by direct connection of the sensor output to more than 40 Plug-in Signal Conditioners. Optional isolated 16 bit analogue output. 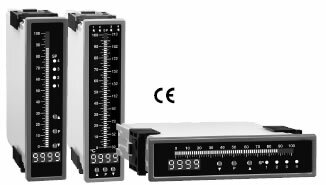 User or factory scalable to 4-20mA, 0-20mA or 0-10V across any desired digital span from ± one count to the full scale range of -1999 to 9999 (12000 counts). A programmable tricolour (Red-Green-Orange) or monocolour (red or green), 101 segment high brightness bargraph. Vertical or optional horizontal format. Red 4-digit LED display with a range of -1999 to 9999 (2000 counts). Optional green digital display. Front panel LED annunciators provide indication of set-point status. Provision for external DIM switch to reduce the brightest display setting by 50%. Automatic intelligent averaging, smooths noisy signals while providing a fast display response to real level changes.